The Fair 2014 - Club Penguin Wiki - the free, editable encyclopedia about Club Penguin's games, rooms, items and parties! The Fair 2014 was a party on Club Penguin. It started on February 19, 2014 and ended on March 5, 2014. The Fair 2014 was the seventh Fair. Unlike previous Fairs, this one started in February, rather than in September. Members were able to buy game booths and play fair games in their igloo. 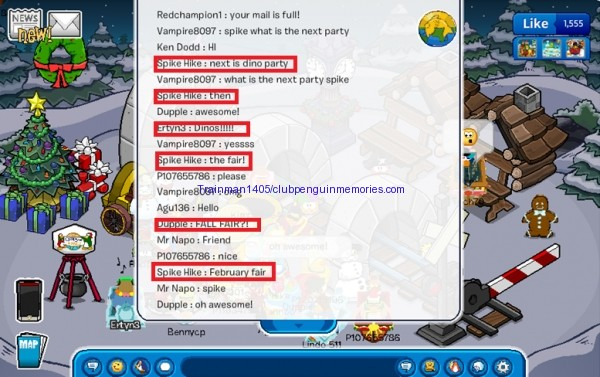 The party was confirmed on December 23, 2013 during Spike Monday. On January 13, an episode of The Spoiler Alert revealed blurred drafts of decorated rooms. On January 28, was revealed in What's New Blog a draft of an another decorated room. On January 29, Polo Field confirmed that Penguin Band will return to the island after over a year since its last visit and confirmed that old Fair games will return. On January 31, Polo Field posted on his personal blog a sneak peek of some room from the party, showing that the red arcade from the Lounge will finally be used. On February 6, an ad on the mainpage, on the login and exit screens showed some items that will be available at the party and that there will be an Amazement park with rides. On the same day, on the membership page, it was revealed that members will be able to buy game booths and play fair games in their igloo and that they will can access unlimited rides. Polo Field also showed another sneak peek of a room and said there will be new prizes, a daily spin and Rookie will visit the island. On February 10, an episode of The Spoiler Alert showed a room and a special map. On February 14, Club Penguin released a sneak peek video, showing how the rides, the rooms and the emoticons are. On February 17, other episode of The Spoiler Alert revealed a new room and how the Penguin Band will appear at the party. A day later, Polo Field confirmed that Penguin Band will not walk around the island. The 13th episode of Waddle On, on February 19, showed some prizes and the rooms, like the Dock. On February 6, Aunt Arctic announced on the issue #433 of the Club Penguin Times that the Fair will be returning and Rookie will organize the party. A week later, on February 13, on the issue #434 of the Club Penguin Times, Aunt Arctic said that the orders for items and decorations had arrived. On the same day, the red arcade from the Lounge disappeared. Similar to previous Fairs, players may collect tickets from playing games and use them to buy items from the Prize Booth. Unlike previous Fairs players could play games in the Bulls Eye and Marooned Lagoon that requires to throw snowballs at targets for 10 tickets. In the Digital World and Buccaneer Boats players can go to a certain location to collect 10 tickets. The Penguin Band had a new show every 10 minutes on the Park Entrance. They sang Anchors Aweigh and if the player clicked on one of the band members, he/she would receive the Penguin Band Giveaway. Rookie also visited the island and he distributed his new background, the Rookie's Giveaway. A total of five free items were made available for this party. After watching Penguin Band perform in Park Entrance. These items were available in the Prize Booth and can only be obtained with tickets ( ). Items marked with a badge ( ) indicate that the item can only be obtained by members. A Sneak Peek of the party revealed during an episode of The Spoiler Alert. Another Sneak Peek of the party revealed during an episode of The Spoiler Alert. A Sneak Peek of the party revealed in What's New Blog. A Sneak Peek of the party revealed in Polo Field's personal blog. Another Sneak Peek of the party revealed in What's New Blog. The map of the amazement park. It is the first Fair to feature a differently-colored sky. This is the first party for the Russian servers. This is also the first Fair to have non-members area in a members-only room. Our archiving project, Club Penguin Archives, has archived some SWFs that are related to The Fair 2014. Click here to view them. This page was last modified on 31 August 2015, at 16:42.